A Laurel and Hardy Double Bill Box set has recently been released by Eureka video. This set contains the company’s previous release of March of The Wooden Soldiers as well as a new title Bogus Bandits They are also available separately. To casual Laurel and Hardy fans these films hold few surprises, but the avid Son of the Desert may notice that these films have been re-titled. 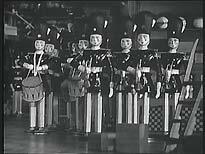 March of the Wooden Soldiers has previously been known as Babes in Toyland. 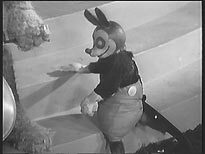 Although the original opening title has been replaced, fans will be glad to hear that the opening song is intact, as are later shots of the Bogey Men that had been deemed too scary for children and edited out of some television presentations. Bogus Bandits has previously been known as Fra Diavolo in Europe, and as The Devil’s Brother in America. (It’s also sometimes known as The Virtuous Tramps). The 1933 film included here is sadly a 1954 edited and re-titled version. While I have never seen the original version I can say that none of the edits that may be contained seem to harm the comedy or narrative flow. 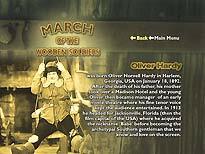 March of the Wooden Soldiers is one of my favourite Laurel and Hardy pictures. From beginning to end it is charming, warm and funny. 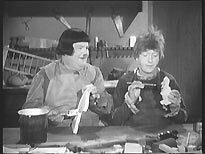 In it the boys play Stannie Dum and Ollie Dee, two toymakers who want to prevent the evil Silas Barnaby from throwing their landlady, Widow Peep, from evicting her. 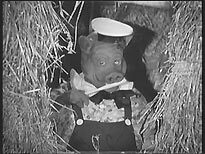 Live action cameos from Disney’s Three Little Pigs and Mickey Mouse have to be seen to be believed, but their cheesy rubbishness only add the film. 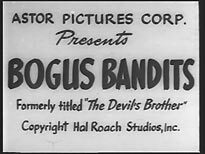 Bogus Bandits finds Ollio and Stanlio in eighteenth-century Italy, press-ganged into helping a group of bandits. 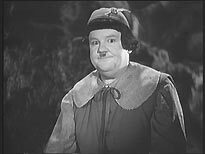 As one of the historical Laurel and Hardy operettas, (it’s loosely based on Daniel-François Auber's 1830 operetta Fra Diavolo), the film seems to be weighed down by some unnecessary singing. 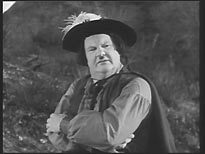 It is, however, still very funny in places, with Dennis King providing great support as rogue bandit Fra Diavolo. The film also features James Finlayson, who’s always most welcome. 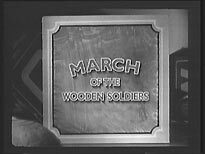 For a budget release, 1934's March of the Wooden Solders is in very good condition. The film is encoded at a respectable bit-rate of 6Mb/sec. Some minor image flicker and moderate film dirt are not too distracting. One thing of note is that a region free colorized version of this exact print is available from Goodtimes Home Video. 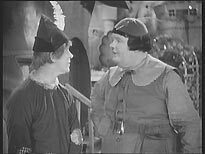 While I am usually against the colorizing of old films, Stan Laurel always regretted that this film was made in black and white, and the colorization is of high standard. It is also better suited for children; this is, after all, a family film. When Bogus Bandits was released on DVD in Australia it received some very poor reviews due to terrible image quality. This UK set is roughly equal in quality to some of those in the recent Universal Laurel and Hardy Box Set. The picture has generally poor contrast and a generally soft appearance, with some significant black crushing causing a lack of shadow detail. Thankfully, dirt levels are well in check. The film is encoded at an average 4.5Mb/sec. Both discs are single-layered DVD-5’s. Sadly there are sadly no subtitles. The quality of the audio is not as impressive as March of the Wooden Soldiers' picture quality. Both tracks suffer from the crackle, hiss and poor dynamic range that you might expect from films of this vintage and provenance. During the musical numbers it is sometimes hard to make out lyrics. It is however quite adequate when it comes to dialogue. Hustling for Health (15m) is one of Stan Laurels earlier solo, silent films from 1915. It is interesting to see him in what becomes a romantic lead. Image quality is surprisingly good for its age, and it is encoded at 5.5Mb/sec. 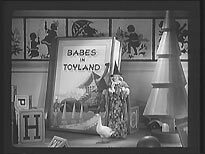 The menu for Bogus Bandits is surprisingly good for a budget title, as the familiar Cuckoo Song plays a window displays a montage of scenes from the film. The scene selection is similarly presented. The only bonus features are text biographies and filmographies, and a modest Stills Gallery, which contains interesting items such as promotional posters and lobby cards. Although the picture quality of Bogus Bandits leaves a lot to be desired, and both films are presented in edited versions, this set is currently the best on the market, and well worth a look. Those who crave unedited prints should lobby Warner Home Video, who currently own the rights.